The modern business has a lot more to worry about than ever. Businesses that rely on a supply chain - especially those that have a distribution wing - have to be in a position to manage every facet of the process. At one time this process was done entirely by phone, but with software that provides the opportunity to manage multiple parts of a business now available, and with shipping companies now utilizing technology to handle their own operations, the modern manufacturer now has a solution to improve their effectiveness. Logistics is the management of resources from the point of origin to the point of consumption. Therefore, it is a crucial part of doing business as a manufacturer. This includes the creation (or assembly) of the product or service to the point where it’s being used by the consumer. Throughout this process, data can be analyzed to determine the most effective and efficient model for getting the job done. Data can even be visualized and optimized by simulation software to allow manufacturers to project themselves into the future and see how operations could be affected. Generally speaking, one of the major goals of logistics is to minimize the use of resources and maximize return on investment. This entails how the production phase of the supply chain is handled. Concepts such as how much of specific products are being created, the parts or objects needed to create said products, and the overall cost of production are taken into account. All of this figures into how costly or cheap it is to create or deliver a product or service. Production logistics can also provide a full inventory of any and all products that are being produced or moved around within the supply chain. 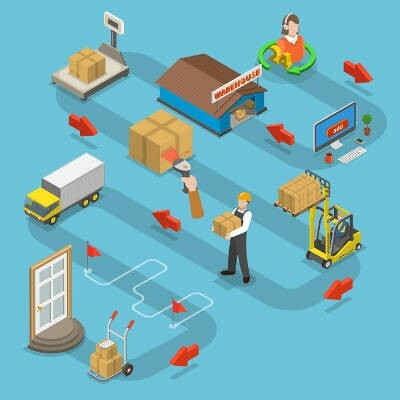 Inventory management software aids in this endeavor, as products can be assigned a barcode, allowing for easy updating of the database they are connected to. This allows for easy management of product while always being aware of how much is available in-house or in production. Asset control is primarily used within retail organizations that have a need for controlling their product once it’s “in the wild,” so to speak. This includes brand management, public relations, and so on. How are a manufacturer’s products being distributed? This type of logistics might include order processing, shipping, and delivery. Distribution logistics is notable due to the fact that the processes involved vary greatly from the processes used in production. How do consumers use goods and products? This likely influences not only the supply chain, but also the operations required to manufacture them in the first place. After all, if certain products are found to not be used by consumers or simply aren’t selling well, these products or services will naturally be weeded out from the production chain. This helps manufacturers make better decisions both now and in the future. Does your organization need assistance with the implementation of IT solutions? k_Street Consulting, LLC can help. To learn more, reach out to us at (202) 640-2737.